Making Family Memories Since 1910. 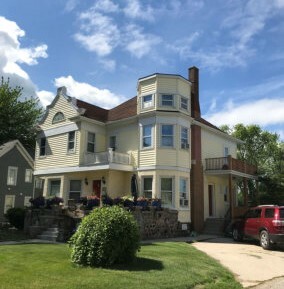 Enjoy a unique vacation experience with family and friends in this gorgeous and historic 4 bedroom Victorian home. Located in the quaint town of Algoma, Wisconsin, you are only a few blocks from the beach, lighthouse, restaurants, Ahnapee Trail, charter fishing, a winery, craft brewery and much more. You have everything you need within walking distance! If you decide to venture out, you’ll find Sturgeon Bay only 20 minutes away, with boat tours, Potowatami State Park, excursions, more beaches, more restaurants, more wineries… you get it! Go further into Door County for fabulous day trips, but come back to the peace and tranquility of Algoma! Our home sleeps 9-12 guests with 2 full baths. Included are a stocked chef’s kitchen with double oven, icemaker, Bunn and Keurig coffee makers, many big screen TV’s, a piano, library, WiFi, cable, 3 patios, grill, a fire pit, 2 outdoor lounging area linens and towels, toiletries, and… Well, you’ll just have to see the rest of our little secrets for yourself!